You don’t just get treated. You get treated with care. With Dr. Jeff Lopez and Dr. Terry Justice — and their wonderful staff — Tri-State Regional Cancer Center has a unique and effective way of combining personal attention and state-of-the-art treatment to help people survive all types of cancer. 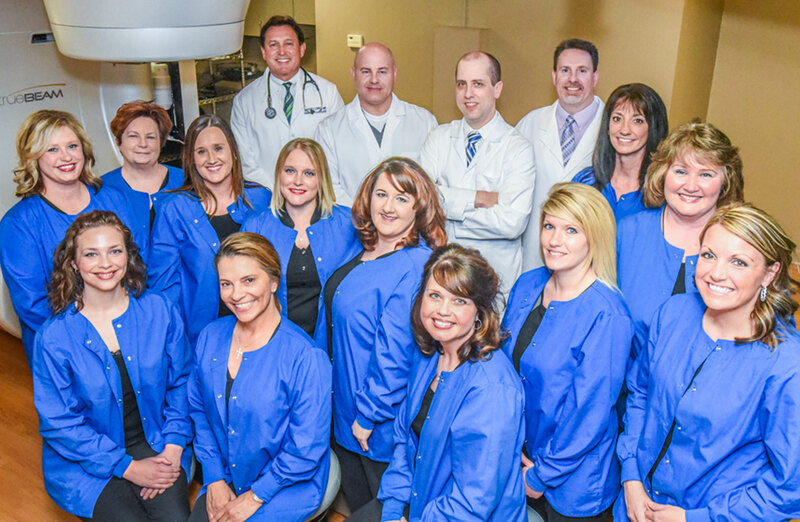 With a focus on prompt and personal attention, we are dedicated to providing the highest level of care available. —Dr. Jeffrey P. Lopez, M.D. How is SRS different from conventional radiotherapy? 2. Fractionation. Fractionation means that the treatment is divided into multiple smaller doses (fractions) of radiation. The reason for fractionation is to improve the radiation effect on the tumor while minimizing the effect on the normal brain. Normal brain tolerates small, daily doses of radiation relatively well. The tumor does not tolerate the small daily doses, resulting in control of the tumor. By exploiting this difference in response, the fractionated treatment can be very effective in reducing or even eliminating the tumor while sparing the normal brain. This concept of fractionation is also very important for radiosurgery, as is discussed below. How does the patient receive treatment? The patient then returns to the treatment area, is positioned on the treatment table, and receives the treatment. In our institution, almost all tumor treatments are fractionated. Thus, the frame is attached to a rigid plastic mask that precisely contours the facial skeletal features. This allows “repeat fixation” of the patient for multiple outpatient treatments that result in no scars as with single dose modalities. The patient feels nothing as the beam treats the tumor. Usually there are none of the side effects typically associated with radiotherapy, such as nausea, red skin, or hair loss. 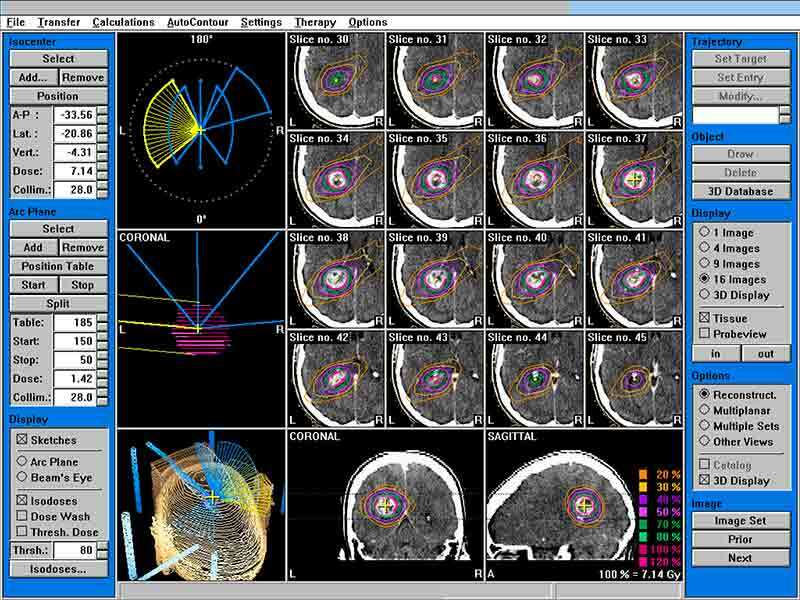 Which tumors can Stereotactic Radiosurgery treat? Radiosurgery can successfully treat many different tumors, both benign and malignant. The malignant tumors treated most often are the “brain metastases” or tumors that have spread to the brain. They are ideal targets, usually spherical, and displace normal brain, rather than “infiltrating” into normal brain. The malignant gliomas have been treated with radiosurgery at the time of recurrence. Our own data show that these results are comparable to those of most other modalities given at the time of recurrence, and have less toxicity. At the time of recurrence, other glial tumors may be successfully treated including the pilocytic astrocytoma and the recurrent “low grade” infiltrating gliomas (Grade I and II). What are the different types of machines for Stereotactic Radiosurgery? 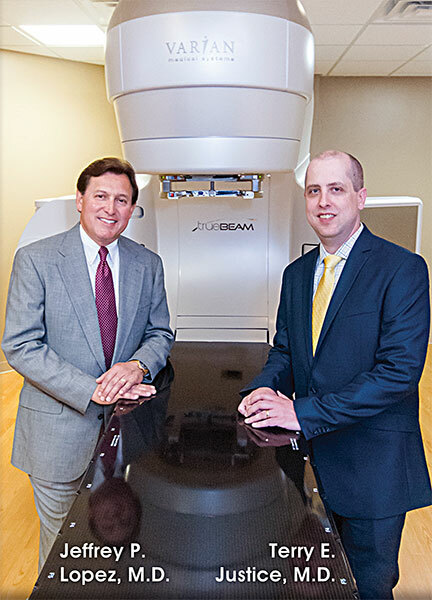 The linear accelerator provides very precise, uniform irradiation for stereotactic radiosurgery of brain tumors. Importantly, this device allows “fractionation” of treatment that allows the safe administration of a higher dose of radiation than can be given with the machines using multiple cobalt sources. The linear accelerator produces radiation having a higher energy than that produced by the cobalt-source machine. Further, the collimators or beam-shaping devices can be larger for the linear accelerators, resulting in much greater uniformity of dose for the larger tumors. The cobalt source machines are also very precise. However, because the frame has to be bolted on to the patient’s head with metal bolts, fractionation of treatment is not possible. Further, the cobalt source machines have smaller collimators that may render larger tumors more difficult to treat with a homogeneous dose of radiation. The proton radiosurgery derives its advantage from the so-called “Bragg peak” that describes deposition of radiation dose from proton beams. As the protons in the beam slow down in tissue, they give up (deposit) disproportionately more radiation per unit of travel. Just before the protons stop, they give up almost all their energy, resulting in a “peak” at that depth in tissue. The depth can be precisely defined by the energy imparted to the proton beam by the cyclotron that produces the beam. Proton beam therapy is useful for many skull base tumors and vascular malformations of the brain. The Peacock system uses “inverse” treatment planning to make a very conformal distribution of the radiation dose in the tumor. It works in a way similar to a CT scanner to precisely determine the amount (weight) for each of many small beams that irradiate the target. This system also allows fractionation. 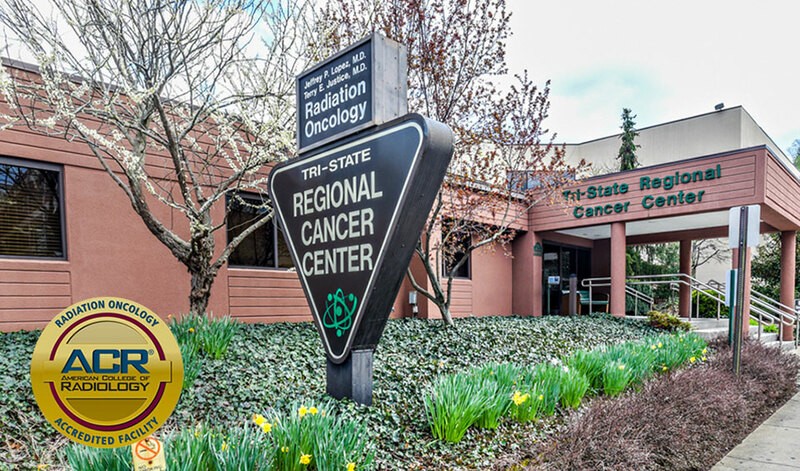 Tri-State Regional Cancer Center has been awarded an accreditation in radiation oncology as the result of a review by the ACR. Radiation oncology (radiation therapy) is the careful medical use of ionizing radiation to treat cancer. A radiation oncologist may use radiation to cure cancer or to relieve a cancer patient’s pain. The ACR has over 500 accredited sites, and 25 years of accreditation experience. The ACR seal of accreditation represents the highest level of quality and patient safety.